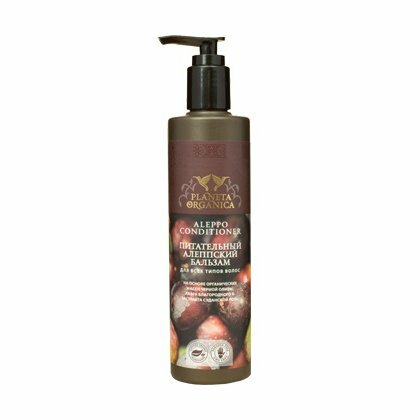 Aleppo Nourishing Hair Conditioner is produced by the Russian brand Planeta Organica. Its formula is based on the traditional recipe that has been used by Syrian women for centuries. The product is formulated with organic vegetable and essential oils that are widely known for their useful properties. For example, organic olive oil excellently moisturises your hair ans scalp and organic bay laurel oil is rich in nutrients. The conditioner also contains roselle (carcade) extract that improves hair elasticity and makes combing much easier. Ingredients. Aqua with infusions of Organic Olea Europaea (Olive) Fruit Oil, Hibiscus Sabdariffa Flower Extract, Organic Laurus Nobilis Oil, Thymus Vulgaris (Thyme) Leaf Extract, Nigella Sativa Seed Extract, Vitis Vinifera (Grape) Seed Oil; Cetearyl Alcohol, Glycerin, Behentrimonium Chloride, Cetrymonium Chloride, Quaternium-87, Hydroxyethylcellulose, Cetrimonium Bromide, Benzyl Alcohol, Sorbic Acid, Benzoic Acid, Citric Acid, Parfum. Want to buy Aleppo Nourishing Hair Conditioner? Call us or submit your order via our web site! i love this condish because it makes my hair really soft and keeps it fresh.it detangles like nobody's business.i consider using it to co-wash(conditioner wash)because i've been wanting to try it for forever and this conditioner seems a good choice to start.